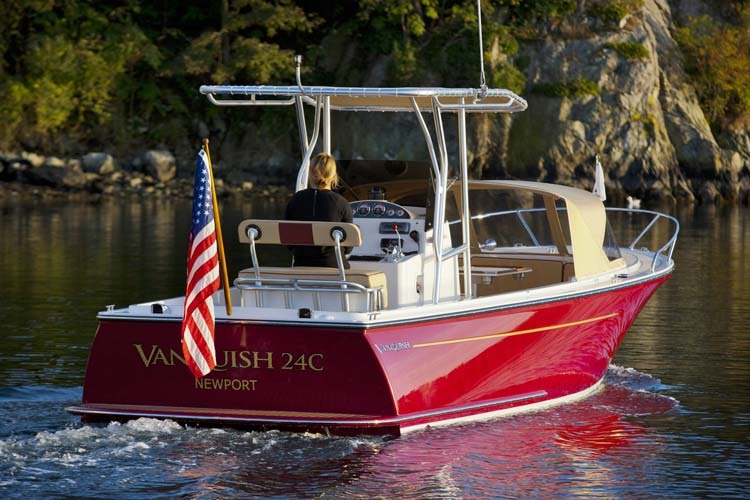 The dual console design does not seem timeless nor traditional—except for the 2015 Vanquish 26 DC. 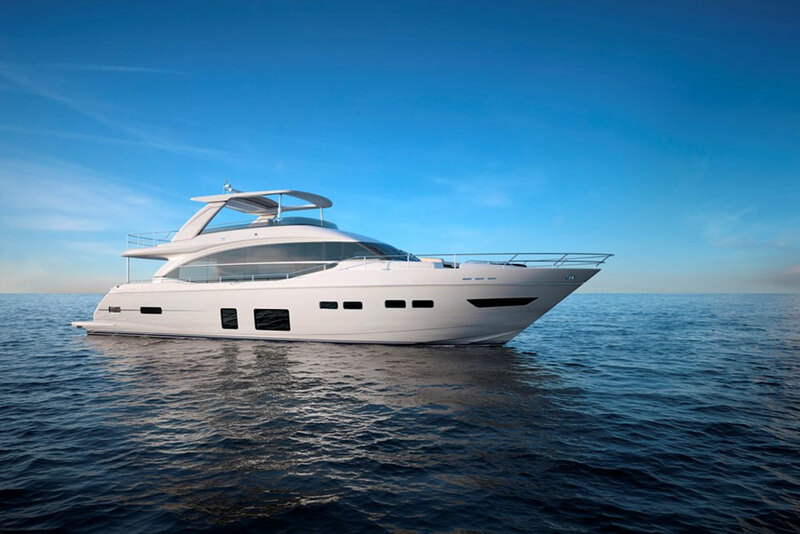 At first glance the dual console design seems an odd choice for Vanquish, a builder that is better known for boats like their 24 runabout and 24 center console. These models feature traits like tumblehome, analog gauges, buttery-smooth fabrics, and straight-inboard propulsion systems. They are, essentially, pocket-yachts. And dual console runabouts just seem so, well, nouveau riche in comparison. That is until you see the Vanquish 26 DC, which looks far more Rockefeller than Zuckerberg. Looking for a mix of classic and modern in a runabout? Then the Vanquish 26 DC should be pleasing to your eyes. 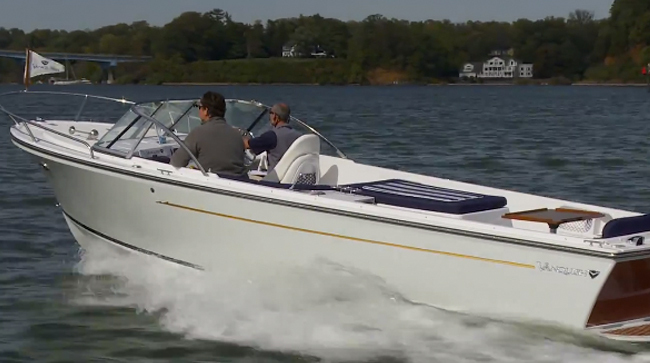 Like its siblings, the 26 DC has that tumblehome at the transom. It also has the high-end fabrics, and analog gauges. But on the passenger’s side across from the helm there is indeed a second console, which houses a modern DC perk: a head compartment. 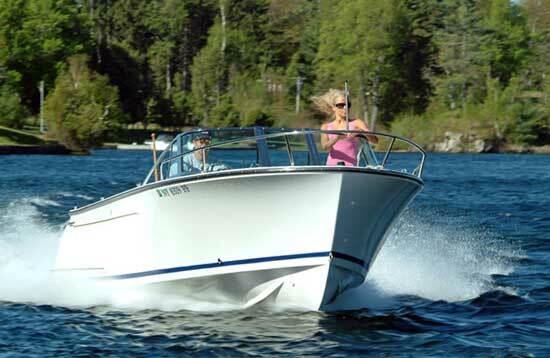 Turn around, and behind the passenger’s seat you’ll find another boating convenience that’s become a must-have in recent years, the wet bar. And, where’s the motorbox? It’s been swapped out for a four-stroke outboard, mounted back on the swim platform/bracket. Construction of the Vanquish is also far from traditional. 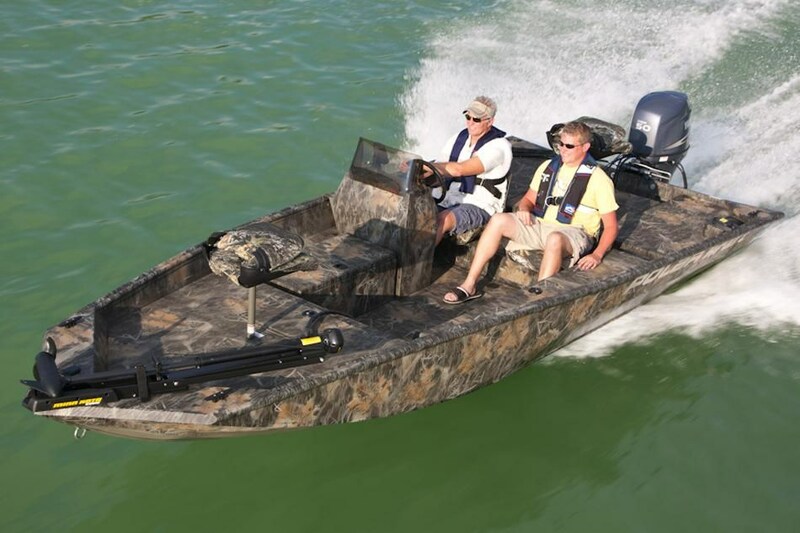 Stringers are reinforced with carbon-fiber, and major sections of the boat are vacuum-infused. Gel coat is Armorflex buff-back (which is about as mirror-like as gel coats get), and the hull to deck joint is sealed with 3M 5200 adhesive/sealant. Does all this come together to make a solid structure? You bet. When we tested the 26 DC a stiff 15 to 20-knot wind had foam blowing off the tight, choppy waves, and the boat chomped through the snot with vigor. In fact, more than once I had to pull back on the throttles and wait for our photo boat to catch up, because they were taking too much of a pounding. Rather than taking a thumping at the helm, however, I was grooving on wave-jumps and soft landings. I was also enjoying the pep this boat showed. With a 250 HP Yamaha four-stroke outboard, I blasted past the 50 MPH mark and cruised at around 40 MPH. That engine was an upgrade over the standard F-200, but in my opinion, a worthy one. If you wanted to save a few bucks, sure, you could go with 50 fewer horses and the speed penalty wouldn’t be huge (plan on cruise speed dropping back three or four MPH, and top-end, about five MPH). But with a starting price well over $100K, the Vanquish is not a boat for penny-pinchers in the first place. Along with the construction, credit for this boat’s smooth riding attributes go to the hull design. 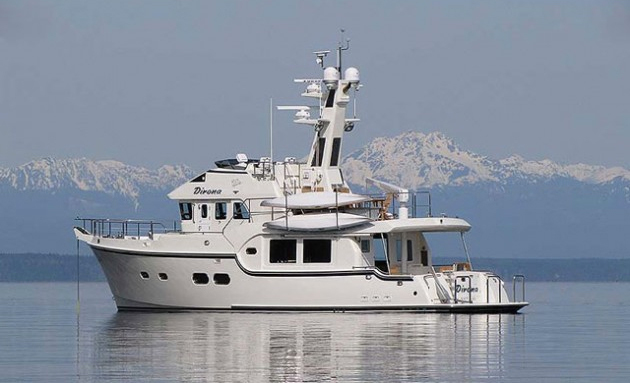 The variable-degree deadrise starts at 50-degrees at the bow, tapers to 24-degrees at the cutwater (when the hull actually meets the waves while on plane), then to 16-degrees at the transom. It’s a good design made better by the fact that this boat has a svelte 8’0” beam; most boats this length are wider, and pound more as a result. The downside to this design is a loss of room, and it does feel a bit more cramped in the cockpit than it might on a boat six inches wider. Is that a walk-in head in the port-side console of the Vanquish 26 DC? You bet. Fortunately, Vanquish makes good use of the space at its disposal. The cockpit includes a large L-settee aft of the wet-bar on the port side, plus a shorter aft-facing lounge behind the helm. A teak-trimmed dinette table fits into a pedestal next to the L-lounge, and stows away neatly underneath of the lounge. If you’d rather do your picnicking in the bow it’s not a problem, because there’s also a pedestal mount for the table up forward. Three can sit around the table up there, but a couple will be better served in the bow by facing forward, and using the seats as lounges. Tall backrests that go up to windshield height and cushioned coaming bolsters will keep things comfy. 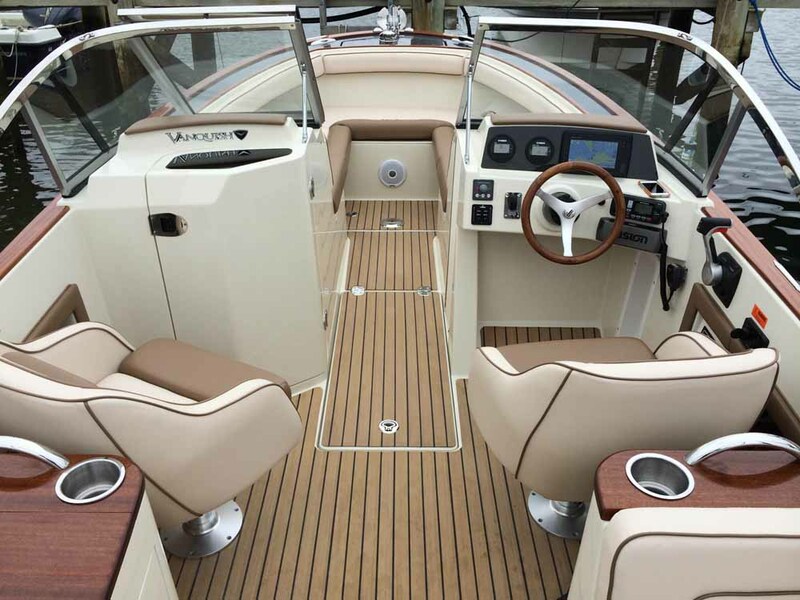 Whichever area of this boat you settle down into, the Vanquish 26 DC is sure to prove one thing: a dual console boat can, in fact, look and feel like a classic. And sitting in one, you can feel a little bit like a Rockefeller. 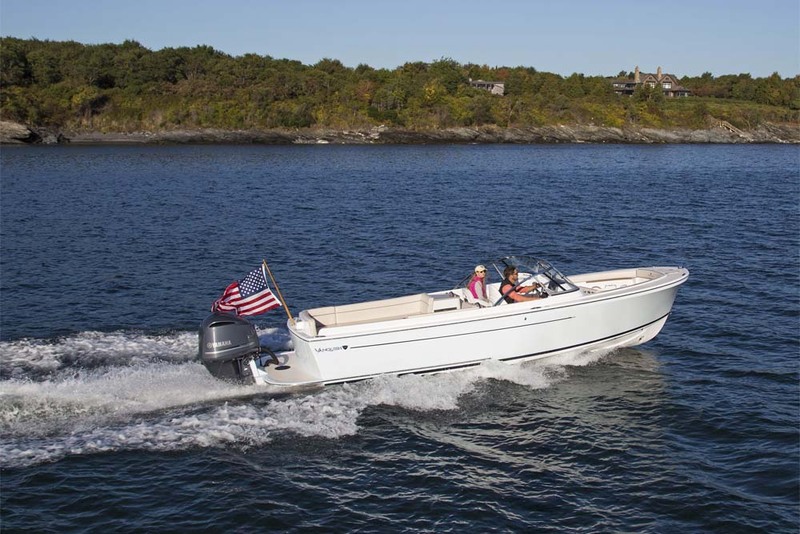 Other Choices: Boats of this ilk are few and far between, but the Chris-Craft Launch 25 is another that evokes a classic nature and grand feeling. 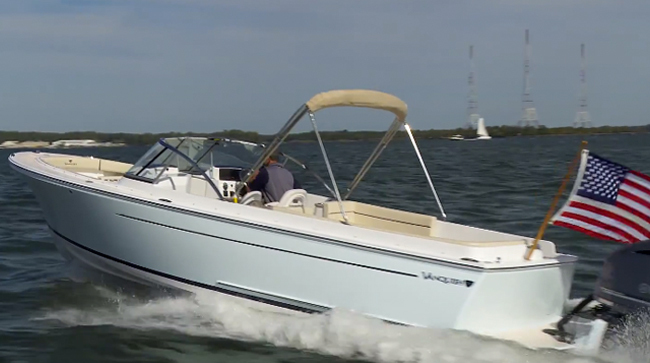 You can also watch our in-depth video review of this boat's little sister: Vanquish 24 Runabout Video Boat Review. See Vanquish 26 listings. Visit Vanquish.